Re-issue of the classic Wireless album. Classy Toronto quartet Wireless were another of the lesser-known bands from the thriving Canadian scene of the 1970s. They occupied the quirkier end of the spectrum alongside Max Webster, Zon and Saga, although I hasten to add that none of these bands sounded remotely alike and all have their own style. Originally from Australia, guitarist Steve McMurray and bassist/vocalist Allan Marshall found themselves travelling the world in search of fame and fortune, eventually arriving in Toronto (via Southampton) in the mid 70s and recording an album of mostly original music as Wireless for Atlantic in 1976. The drummer and vocalist left after the s/t debut and the Australian pair and Canadian guitarist Mike Crawford were joined by Canadian drummer/vocalist Marty Morin, the new line-up being picked up by Rush's Anthem label and management and the band released this album in 1978. Another Anthem employee, former Max Webster bassist Mike Tilka, was brought in to produce. 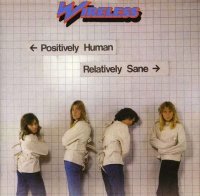 'Positively Human, Relatively Sane' was a bit of a departure for the label, it's left-field melodies and arrangements tempered by subtle guitar harmonies, funky bass lines and Marshall's soulful voice (he was just the bass player on the debut!). The playing was different and sublime, if a little laid back at times, the ringing guitar sounds and harmonies being closer to Steely Dan than the expected hard rock. Songs like 'Goodnight Ladies', 'I Know You Know' and 'Sign Right Here' don't so much club you over the head as seduce you over time with their subtlety and rhythmic cleverness, while the frantic riff in the middle of 'Right To Beg' and scorching twin guitars of 'The Hard Way' are the exceptions rather than the rule. Drummer Marty Morin turned out to be a real diamond who not only brought some intelligent percussion to the table, but also sang some really good lead vocals on the infectious 'What You Make It' and the mellow groover 'The Rut'. The multi-textured '451 Markham' was their most ambitious statement and still gives me goosebumps every time, over thirty years later. Yours truly only came into contact with Wireless due to the involvement of Geddy Lee as producer of their next album 'No Static', which I loved so much that I had to go back and buy their earlier albums at inflated import prices. I still think the debut is rather patchy and I was also originally disappointed with the lighter style of 'Positively Human...', especially as £5.49 seemed an awful lot of money back in 1980, but because I paid so much for it I persevered and grew to like it a lot. It's not the most immediate Wireless album but has a lot of quality moments and some truly original ideas. Unfortunately it didn't sell that well and the band considered splitting up soon after, despite frequently touring as support to Rush and April Wine.